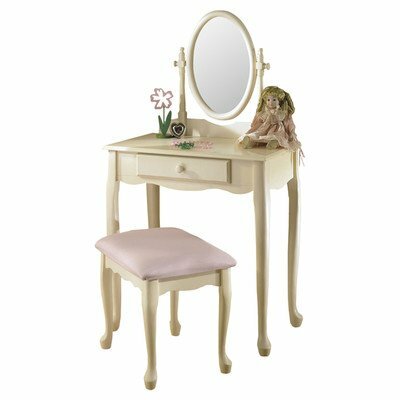 Vanity Set with Mirror by Wildon Home at Indsight. MPN: 929-290. Hurry! Limited time offer. Offer valid only while supplies last. 929-290 Features: -Queen Anne legs. -Off-white finish. Finish: -Off-White. Life Stage: -Teen. Life Stage: -Kids. Number of Items Included: -2. 929-290 Features: -Queen Anne legs. -Off-white finish. Finish: -Off-White. Life Stage: -Teen. Life Stage: -Kids. Number of Items Included: -2. Primary Material: -Wood. Drawers Included: -Yes. Mirror Included: -Yes. Style: -Traditional. Product Type: -Vanity set. Adjustable Mirror: -Yes. Dimensions: Overall Height - Top to Bottom: -51 Inches. Overall Width - Side to Side: -28 Inches. Overall Depth - Front to Back: -15.875 Inches. Overall Product Weight: -46 Pounds. If you have any questions about this product by Wildon Home, contact us by completing and submitting the form below. If you are looking for a specif part number, please include it with your message.